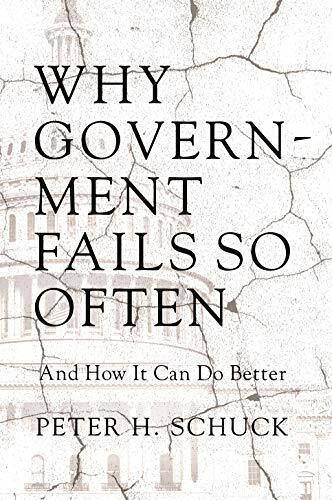 [PDF] Why Government Fails So Often: And How It Can Do Better | Free eBooks Download - EBOOKEE! Description: From healthcare to workplace conduct, the federal government is taking on ever more responsibility for managing our lives. At the same time, Americans have never been more disaffected with Washington, seeing it as an intrusive, incompetent, wasteful giant. The most alarming consequence of ineffective policies, in addition to unrealized social goals, is the growing threat to the government's democratic legitimacy. Understanding why government fails so often and how it might become more effective is an urgent responsibility of citizenship. In this book, lawyer and political scientist Peter Schuck provides a wide range of examples and an enormous body of evidence to explain why so many domestic policies go awry and how to right the foundering ship of state. Schuck argues that Washington's failures are due not to episodic problems or partisan bickering, but rather to deep structural flaws that undermine every administration, Democratic and Republican. These recurrent weaknesses include unrealistic goals, perverse incentives, poor and distorted information, systemic irrationality, rigidity and lack of credibility, a mediocre bureaucracy, powerful and inescapable markets, and the inherent limits of law. To counteract each of these problems, Schuck proposes numerous achievable reforms, from avoiding moral hazard in student loan, mortgage, and other subsidy programs, to empowering consumers of public services, simplifying programs and testing them for cost-effectiveness, and increasing the use of "big data." The book also examines successful policies including the G.I. Bill, the Voting Rights Act, the Earned Income Tax Credit, and airline deregulation to highlight the factors that made them work. An urgent call for reform, Why Government Fails So Often is essential reading for anyone curious about why government is in such disrepute and how it can do better. No comments for "[PDF] Why Government Fails So Often: And How It Can Do Better".